Smucker Manufacturing Weed Wiper customer reviews. "Your sponges worked as promised using Gramoxone (50%). Your videos were on the money & very useful in the application process." "Put a 60 ft kit on my Hardi 3 point hitch sprayer and I got great results using Gramoxone at 50 % to control the resistant weeds in his soybeans." 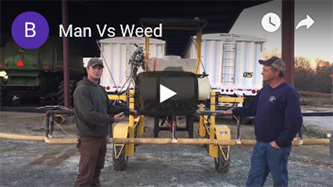 "I use a pull type sponge weed wiper to control my resistant weeds for less than $1 per acre. My neighbors are turning their heads when they drive by my field and see the results." "After 24 hours of running 50% gramoxone in your weed wipers, my resistant weeds were taken care of. Thanks for a great product. " "At first I was a little Leary, but the sponges work. At first, I used it in my soy beans...until I realized that it's great for pastures and other applications. I had a very great experience with Smucker Manufacturing." "We adapted a sponge weed wiper to our self propelled detassel machine. 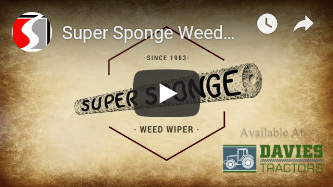 We are Non GMO growers and have seen the results of wiping out resistant weeds with 50% Gramoxone...sponge wipers give great results for around just $1 per acre."